Of course you fashionistas out there know LBD is the every popular, and wardrobe staple, "little black dress". This item is not only versitile, but a necessity in the closet of every woman. The fashion must-have was presented to us by none other than Coco Chanel, and has stood the test of time. The fashion industry is now paying its respects to the concept. The Council of Fashion Designers of America (CFDA) has teamed up with Mattel to create a series of Barbie dolls doning various LBDs. Dresses were designed by such CFDA notable members as Isaac Mizrahi, Tory Burch, Rachel Roy, Alexis Bittar, and Betsey Johnson. 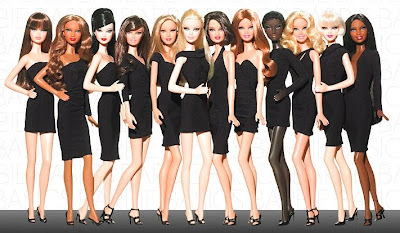 The commemorative dolls are marketed for adult Barbie collectors, to share in the fashion world's respect for the beloved LBD. Although some are upset by the amount of skin some of the dolls are showing, or the cut of their black attire, the thought and passion behind the idea is in the right place. Will you be adding to your Barbie collection?